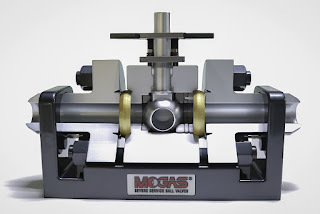 MOGAS’s SC-3PC isolation ball valve in closed position. Some ball valves have been developed with a spherical surface coated plug that is off to one side in the open position and rotates into the flow passage until it blocks the flow path completely. Seating is accomplished by the eccentric movement of the plug. 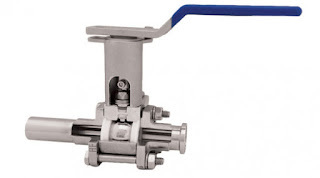 The valve requires no lubrication and can be used for throttling service. 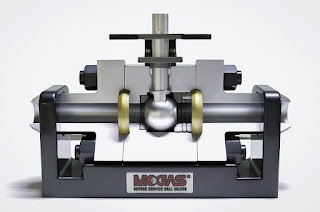 MOGAS’s SC-3PC isolation ball valve in open position. Conventional ball valves have relatively poor throttling characteristics. In a throttling position, the partially exposed seat rapidly erodes because of the impingement of high velocity flow. There are exceptions though, and ball valves can be used as control valves when modification to characterize the flow port are taken. For more information about any style industrial valve, contact CTi Controltech at 925-208-4250 or visit http://www.cti-ct.com.